If you hesitate when you smile, would like to increase your self-confidence, or prefer to eliminate any dental imperfections you may have, consider porcelain veneers. 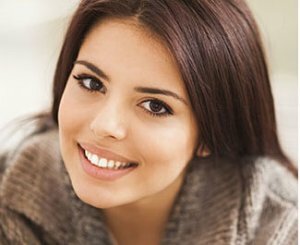 With veneers, the best smile of your dreams can become a reality after just a few appointments. Veneers are made of thin, wafer-like porcelain shells that are customized to the exact shape, size, and color you desire. They adhere to the surface of your natural tooth, and instantly transform your appearance. At the first appointment, doctor prepares your teeth and take an impression to be sent to a lab to fabricate the veneers. We will need to create some space to allow for the veneers to be placed and look natural. This is done by removing a very small amount of tooth material from the face (front), bottom, and sides of each tooth. You will leave the office with temporary veneers for the next week or two while the permanent veneers are being made. Veneers are individually sculpted for your smile, so it’s nearly impossible to tell the difference between a veneer and a natural tooth. They resist staining from coffee, tea, red wine, and tobacco, though we recommend you avoid excessive exposure to these substances if you wish to maintain the beauty of your veneers over the long term. To maintain your porcelain veneers is a simple task: Treat them as you would your original teeth, with routine brushing and flossing. Use non-abrasive fluoride toothpaste, and be sure to visit our office for your twice-yearly dental cleaning and exam!